Neat! Tim Hortons Unveils "The Priestley"
Baskin-Robbins' Flavor of the Month for February 2013 is the Valentine's Day-themed Bundle of Love ice cream. 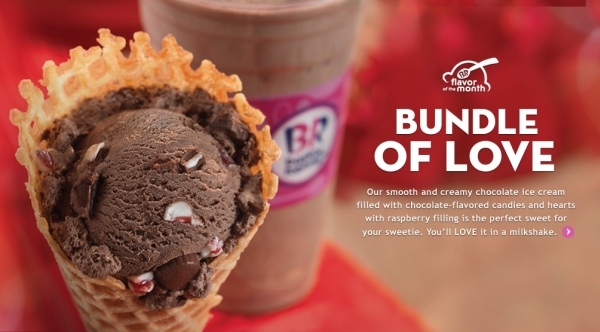 Bundle of Love features chocolate ice cream mixed with chocolate-flavored cups and raspberry-filled chocolate-flavored hearts. The flavor is available by the scoop (in a cup or cone) or as the base for a milkshake. You can also buy it to take home in a hand-packed pint, quart, or half-gallon. Additionally for this month, Baskin-Robbins offers new Conversation Heart Cakes which are basically a cake version of the Valentine's Day candy of the same name. 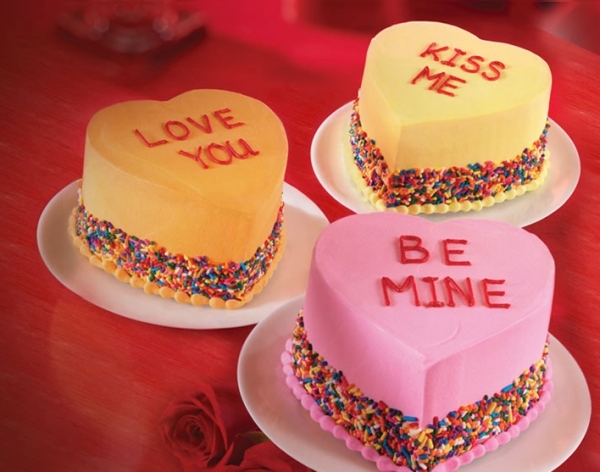 The heart-shaped cakes are decorated with rainbow sprinkles and feature one of three messages: "Love You," "Kiss Me," and "Be Mine." Like a regular cake, they can also be ordered with a personalized message. Each cake is meant to serve 2 to 4 people and carry a suggested retail price of $14.29.